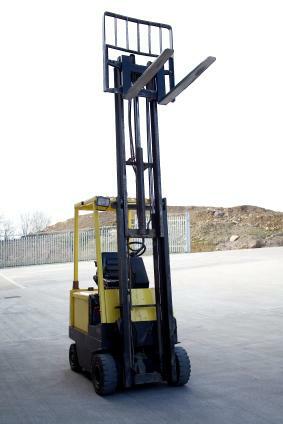 Workers often have to use a forklift to do repairs or work in areas that are high above floor or ground level. To maintain standards of safety, OSHA has approved a series of guidelines that must be followed when workers are lifted by a forklift in an OSHA approved safety cage. To read these guidelines click here. Each forklift safety cage is built to hold two workers plus any equipment or tools that they need. The gates of the safety cage are made to open in an inward direction, never outward. Once the gates close, a spring tension latch holds them securely in place. A non-slip material is used on the floor of all forklift safety cages and there is a raised lip around the outer edge of the cage floor. The safety cage attaches securely to the forks of the forklift using two safety pins. The pins lock the safety cage tightly into place behind the heels of each of the forks. It is very important to check the load limit before you attach the safety cage to the forklift. The load capacity varies based on the manufacturer and model of the forklift. To check the load limit of a specific forklift, use the vehicle's manual to verify loading capacity. Always make sure to include the weight of the safety cage along with the weight of the people and tools that will be inside of the cage. It is imperative that the platform is attached securely to the forklift carriage or backrest. In certain instances, the platform is attached to both the carriage and the backrest. This is necessary to ensure that the forklift truck is capable of supporting the total weight of the safety cage and its contents. Once the safety cage has been secured to the forklift, it is very important that the forks do not move at all. This safety cage for a forklift has two safety sleeves that are full length. There are internal handrails for safety to prevent crushed hands and fingers. A stainless steel safety cage is made for outdoor use and for use in the chemical, food and pharmaceutical industries. The stainless steel checkered floor has edges that are turned down so water can flow off easily. Following the proper guidelines and safety standards for forklift use ensures a safer working environment. Using a forklift safety cage prevents many injuries and deaths each year due to work place accidents.